Deliver combos to your special ones dwelling in Mumbai. A faced-paced city like Mumbai requires even faster delivery services. We do the best job. Send combos to Mumbai online from a spectrum of combos of lip-smacking cakes, fresh flowers, rich chocolates, cute teddies and so on and delight your loved ones. Who does not want to be pampered? We all love to! You can also pamper, the one you desire the most with some of the unique and amazing combo gifts in Mumbai in the most convenient way. Yes, now it’s possible, as MyFlowerTree brings a wide range of exquisite products to surprise the one you love with a beautiful combo of flowers, cakes, teddy bears and personalized gift items. You can choose our customized Combo Gifts Delivery in Mumbai to surprise your loved ones. The widest collection of stunning gifts is available here at MyFlowerTree. You can pick the best one to surprise your special people. You can choose from this collection like a rose stem in a vase with teddy, 10 long stem red roses with teddy bear, bouquet of red roses with 5 dairy milk chocolates, celebrations with red roses, mixed roses with teddy bear, red rose with fererro rocher, mixed roses, greeting card and celebrations, pink roses with dairy milk silk, bouquet of gerberas with celebration, yellow rose with cake, 12 pink carnations with teddy bear, red flowers with scrumptious cakes, 6 blue orchids with dairy milk silk, chocolate cake with lilies and dairy milk chocolates, arrangement of 100 to 1000 heart shaped roses with cute teddy bear, 10 yellow glads with Fererro Rocher, 6 white orchids with half kg truffle cake, yellow roses with butter scotch cake, Mix dry fruits with 12 red roses and 3 white Asiatic lilies, a beautiful pink floral basket with chocolate truffle cake, red roses with wine, assorted Asiatic lilies with chocolate cake, carnations and wine, roses with teddy and wine, a glorious red night combo containing 15 red roses with a bottle of wine and 16 pcs Ferrero Rocher chocolates, a basket of 60 red roses with bottle of wine, etc. we have an unlimited range combos that you can send to Mumbai. 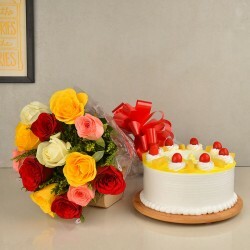 You can also get our immediate service of Cake and Flower Delivery Mumbai. We give immediate and customized delivery services for the delivery of combo gifts at any time you want, such like mid night delivery, mid-morning delivery, same day delivery and fixed time delivery services. one can get easiest delivery services for all products perfectly. Products in this category have been rated 4.5 out of 5 based on 130 reviews.